TODAY I'M TAKING MONOCHROME TO DARK, DARK PLACES. Many of you know of of my love of the colour blue and monochromatic palettes, so I thought I'd show you one of my favourite cooler climate ensembles. I have paired my bespoke suit in midnight with a black window pane check with a midnight blue merino turtle neck. 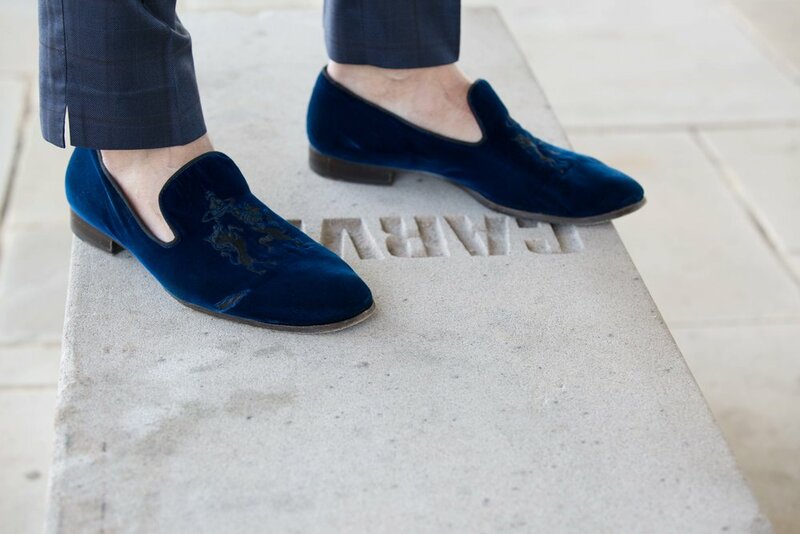 Accessories are a black silk pocket square gold frame aviators and blue velvet slippers. This is the kind of outfit I wear to cocktail events in Winter/ Spring. In creating a look like this my process is three steps. Step #1 Comfort, check the weather as comfort is first and foremost. Step #2 Audience, is it an event, friends or clients that I will see today, and whats appropriate. Step #3 Feeling, my personal style is a representation of how I feel every time I step out the front door. 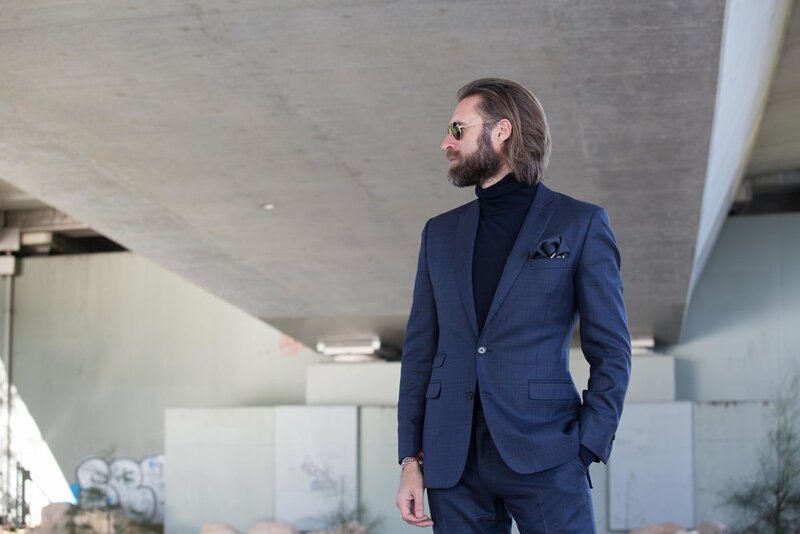 For this ensemble, I started with my bespoke navy and black window pane check suit and added the midnight merino wool turtleneck sweater. 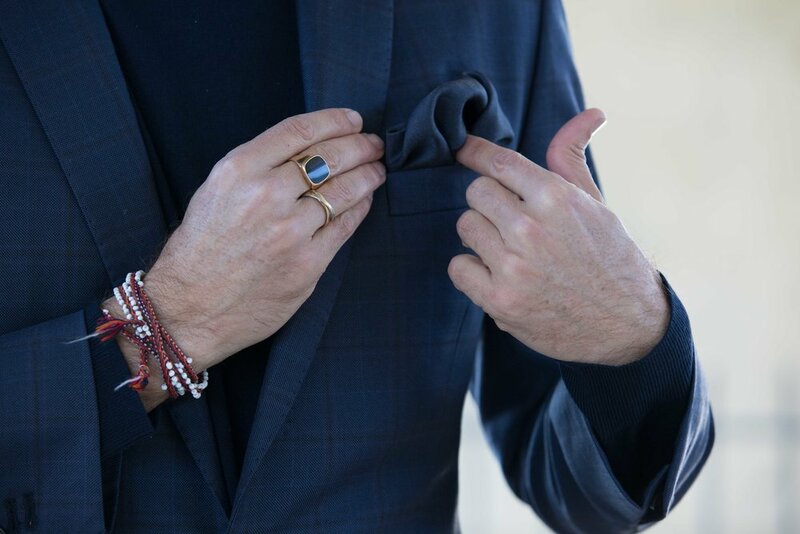 Accessories are a black silk pocket square, gold frame aviators and blue velvet slippers. Warm, comfy and event appropriate, see the line up of designer, bespoke and high street labels below.